You may recall that there was a Shapeways sale for Cyber Monday 2018, which I know was quite a while ago. Naturally I bought some of my own ships during the sale (why not save more?) and they arrived just after Christmas. I got six Confederation frigates of three classes, five Imperial escorts of two classes, two more D6s, and a sprue of shuttles. 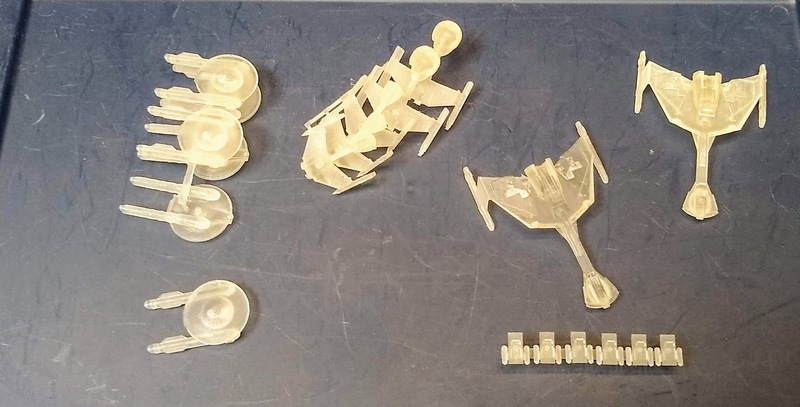 The printing seems to have come out perfectly, except that the sprue for the Imperial escorts was twisted and one of the frigates popped off its sprue. I have an order of bases from Brigade Miniatures to go with these, and some magnets from eBay coming from China, and then I can get them based up and off to primer. Looking forward to painting these sometime soon... at least before I buy a Unionist or Star Empire fleet! Very nice. What material are they? @Chris - Shapeways currently calls this material "Smooth fine detail plastic" but it is a UV set resin. UV set resin? That's all new to me. Looks fairly good though detail wise. I saw your comment over on my blog and came here to check your's out. It looks like we both had the same idea during the last sale along with some similar interests! Some trek designs will actually probably be my next order as I'm curious if uploading the various designs available free online will work without tweaking for small scale printing (like increasing the depth on details like panel lines). @Stew The main goal is to make ships that I want to have in my fleet, or that are just fun to sculpt. I have made a few bucks though, so that is nice too! @Sitzkrieg! There are a ton of Trek designs out there, but with my limitations on sculpting tools (and skills) I found it was actually easier to do my own ships than it was to download and modify a ship made by someone else. I have a number of unprintable designs because the downloaded ship has too many errors, which is a bummer. Out of curiosity, do you use the various "fixer" programs out there? I don't have any 3d modelling skills beyond simple tweaks and I've successfully used programs like Netfabb to correct hundreds of errors in a model with a few clicks. Mixed success with various webtools, and they often have pretty limited file size limits. Taking that 1/2500 file and making it 1/3788 ought to be a lot easier than it has been for me! Those ships look brilliant (and give me fond memories of playing epic Star Fleet Battles in the 80's). What are you using as your 3D design software? Curt C, I use TinkerCAD, which is very simple and easy to learn. Unfortunately I think I have reached it limits for space ships, since sculpting curved shapes is much harder. Thanks for the response. TinkerCAD is what I used when I first started but, like you, I want to 'graduate' to something a little more full-featured.